Welcome to the Brockham History website.! Brockham is an idyllic village in Surrey steeped in history. The village has a traditional community feel to it that has been lost in so many other areas of the UK. The aim of this site is to bring some of this history back to life. The information on these pages is built up of personal memories, local facts and stories. Many people have been touched by Brockham in some way or another, so skim through the rich tapestry of photos, stories and background and discover what made Brockham the famous village it is today. 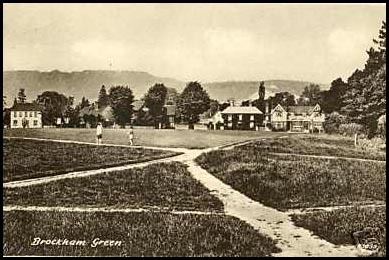 Please Note - This site is not intended to be a definitive history of Brockham; a lot of the information that has been gathered and published here has come from personal recollections and resident's memories, so may not be factually accurate. It does, therefore, make for a fascinating insight into how things were many years ago, from those peoples perspective. To make it easy to find your way around the wealth of information that this site will ultimately contain, we have divided the content into a number of different, interlinking categories, and you can select those from the links on the left. The information throughout the site is going to grow as more information comes to us. That's where we need YOUR help. If you have any historical information about the buildings, people or the neighbourhood; if you can fill in any missing data, we want to hear from you. The content so far has been gratefully recieved from various people in the village, whom we would like to thank enormously. Other contributions - Sue Smith, Reg Glanfield, Ann Clinch, Katie Dodson, Lorna Hines, Michael Budd, Joan Redmond and Jane LeCluse. If we've missed your name off, we sincerely apologise. Please contact us so we can add your name to the list. © text and photos on this website are the Copyright of the original authors / providers of the content.